NOD mice deficient for B lymphocytes from birth fail to develop autoimmune or type 1 diabetes. To assess whether B cell depletion influences type 1 diabetes in mice with an intact immune system, NOD female mice representing early and late preclinical stages of disease were treated with mouse anti-mouse CD20 mAbs. Short-term CD20 mAb treatment in 5-wk-old NOD female mice reduced B cell numbers by ∼95%, decreased subsequent insulitis, and prevented diabetes in >60% of littermates. In addition, CD20 mAb treatment of 15-wk-old NOD female mice significantly delayed, but did not prevent, diabetes onset. Protection from diabetes did not result from altered T cell numbers or subset distributions, or regulatory/suppressor T cell generation. Rather, impaired CD4+ and CD8+ T cell activation in the lymph nodes of B cell-depleted NOD mice may delay diabetes onset. B cell depletion was achieved despite reduced sensitivity of NOD mice to CD20 mAbs compared with C57BL/6 mice. Decreased B cell depletion resulted from deficient FcγRI binding of IgG2a/c CD20 mAbs and 60% reduced spleen monocyte numbers, which in combination reduced Ab-dependent cellular cytotoxicity. With high-dose CD20 mAb treatment (250 μg) in NOD mice, FcγRIII and FcγRIV compensated for inadequate FcγRI function and mediated B cell depletion. Thereby, NOD mice provide a model for human FcγR polymorphisms that reduce therapeutic mAb efficacy in vivo. Moreover, this study defines a new, clinically relevant approach whereby B cell depletion early in the course of disease development may prevent diabetes or delay progression of disease. Type 1 diabetes (T1D)5 is an autoimmune disease affecting ∼1 million of the diabetic patients in the United States (1). As T1D patients require lifelong insulin therapy and have a high risk of medical complications, preventative or curative therapies are urgently needed. Based on studies using the NOD mouse, a spontaneous model of T1D, autoimmune destruction of the insulin-producing pancreatic β cells is primarily mediated by CD4+ and CD8+ T cells (2). Diabetes onset is initially detected at 13–15 wk of age, with 80 and 20% of NOD female and male mice, respectively, having developed diabetes by 30 wk of age (2). Most therapies have focused on disease-modifying agents targeting the T cell compartment directly, including the induction of immunoregulatory T cells, blockade of T cell costimulation, and T cell depletion (1, 3). Therapies that reduce Ag-specific T cell clonal expansion have profound effects during the prediabetic stages of disease (4), while few therapies reverse disease once the clinical manifestations of diabetes are evident (2). B cells and humoral immunity may also play a role in T1D development or disease progression (5). B cells are among the earliest cells to infiltrate the pancreatic islets of NOD mice (6, 7), where they organize along with T cells into lymphoid structures with germinal centers that may promote the selection of autoreactive B cells (8). Due to defects in B cell tolerance, NOD mice exhibit elevated serum IgG levels and produce anti-insulin and pancreas-specific autoantibodies, as well as natural thymocytotoxic autoantibodies (9). Continuous B cell depletion in NOD mice by anti-mu Ab given after birth abrogates insulitis development (10). Similarly, NOD mice with a congenital B cell deficiency generally lack islet infiltration or insulitis and are free of overt diabetes (11, 12, 13, 14). Although the development, repertoire, and function of T cells and the immune system are abnormal in B cell-deficient mice (14, 15), disease resistance in B cell-deficient NOD mice is abrogated by B cell reconstitution, but not by the transfer of NOD serum (16). The mechanisms by which congenital B cell deletion affects disease are likely to be multifaceted, but B cells have been suggested to be the crucial APCs for the development of proinflammatory T cell responses to β cell Ags in addition to serving as the source of autoantibodies (16, 17, 18, 19). Because B cell depletion in humans using the chimeric rituximab CD20 mAb is proving to be effective in treating some autoimmune diseases (20, 21), a role for mature CD20+ B cells in T1D pathogenesis was assessed in NOD mice using CD20 mAbs (22). Mouse anti-mouse CD20 mAbs effectively deplete B cells from adult mice with fully developed immune systems allowing for mechanistic studies, detailed tissue analysis, and genetic manipulation (23, 24, 25, 26, 27, 28). CD20 is a B cell-specific molecule that is first expressed on the cell surface during the pre-B to immature B cell transition, but is lost upon plasma cell differentiation (22, 29). In mice, CD20 mAbs deplete B cells rapidly by Ab-dependent cellular cytotoxicity (ADCC) through the engagement of FcγR on monocytes (23, 25, 30). Mouse effector cells express four different FcγR classes, FcγRI, FcγRII, FcγRIII, and FcγRIV (31, 32), that contribute significantly to isotype-specific effectiveness of CD20 mAbs in vivo (25, 33). Therefore, NOD mice were treated with IgG1, IgG2a/c, and IgG2b CD20 mAbs in a dose-dependent manner to assess whether therapeutic B cell depletion in mature mice with intact immune systems could deplete B cells and influence T1D progression. Wild-type C57BL/6J, NOD/Lt, and NOD/LtSz-scid/scid (NOD.scid) mice were obtained from The Jackson Laboratory. FcγRI/III−/− C57BL/6 mice were generated in our laboratory by crossing FcγRI−/− and FcγRIII−/− mice (25). All mice were housed in a specific pathogen-free barrier facility. These studies were approved by the Animal Care and Use Committee of Duke University (Durham, NC) or University of North Carolina (Chapel Hill, NC). Mouse CD20-specific mouse mAbs MB20-11 (IgG2c), MB20-18 (IgG2b), and MB20-1 (IgG1) were as described (23). IgG2a and IgG1 isotype switch variants of the MB20-18 mAb were produced by transient cotransfection of 293T cells with expression plasmids containing engineered H chain and native L chain cDNAs. Abs were subsequently purified from culture supernatants using protein A or G affinity chromatography columns as suggested by the manufacturer (Amersham). The 9G8.1 hamster anti-mouse FcγRIV mAb (provided by J. Ravetch, Rockefeller University, New York, NY) was as described (34). FITC-conjugated mAb reactive with L-selectin (CD62L; clone LAM1-116) was as described (35). Other mAbs used included: B220 mAb (RA3-6B2), CD1d (1B1), CD5 (53-7.3), CD11b (M1/70), CD16/32 (2.4G2), CD21 (7G6), CD24 (M1/69), CD25 (PC61), CD28 (37.51), CD40L (MR1), CD44 (IM7), CD69 (H1.2F3), and OX40 (OX-86) mAbs (BD Pharmingen). CD3 (145-2C11), CD4 (L3T4), CD8α (53-6.7), and CD19 (1D3) mAbs were obtained from eBioscience. Intracellular staining used mAbs reactive with CTLA-4 (UC10-4F10-11; BD Pharmingen) and Foxp3 (FJK-16s; eBioscience) and the Cytofix/Cytoperm kit (BD Pharmingen). Isotype-specific anti-mouse secondary Abs were obtained from Southern Biotechnology Associates. Background staining was assessed using nonreactive, isotype-matched control mAbs (Caltag Laboratories). Single-cell suspensions of bone marrow (bilateral femurs), spleen, and peripheral lymph node (paired axillary and inguinal) lymphocytes were generated by gentle dissection. To isolate peritoneal cavity leukocytes, 10 ml of cold 0.2% BSA in PBS buffer was injected into the peritoneum followed by gentle massage of the abdomen. For two- or three-color immunofluorescence analysis, single-cell suspensions (1 × 106 cells) were stained at 4°C using predetermined optimal concentrations of mAb for 20 min as described (36). Blood erythrocytes were lysed after immunofluorescence staining using FACS lysing solution (BD Biosciences). Cells with the forward and side light scatter properties of lymphocytes were analyzed using a FACScan flow cytometer (BD Biosciences). Islets were purified as described (37). Briefly, pancreata from NOD mice were perfused with 2 mg/ml collagenase P (Roche) and digested for 20 min at 37°C. Islets were purified from digested tissues using a Ficoll gradient and then handpicked. Purified islets were dissociated into a single-cell suspension using enzyme-free cell dissociation solution (Sigma-Aldrich), washed, and cultured overnight in RPMI 1640 complete medium (Mediatech) containing 10% FBS (Sigma-Aldrich), 2 mM glutamine, 100 U/ml penicillin, 100 μg/ml streptomycin (Mediatech), 55 μM 2-ME (Invitrogen Life Technologies), and 4 ng/ml recombinant murine IL-2 (PeproTech). For FcγRIII and FcγRIV expression analysis, macrophages were elicited by i.p. injection of 1 ml of 3% w/v thioglycolate (Sigma-Aldrich). After 4 days, peritoneal cavity cells were collected by lavage or isolated from single-cell splenocyte populations (34). Sterile CD20 and isotype control mAbs (1–250 μg) in 300 μl of PBS were injected i.v. into the lateral tail vein. Blood leukocyte numbers were quantified by hemocytometer after red cell lysis, with blood and tissue B220+ cell frequencies determined by immunofluorescence staining with flow cytometry analysis as described (23, 25). In some cases, 1 ml of 3% thioglycolate solution was injected i.p. into mice 1 day before mAb treatment. For B cell depletion analysis in NOD mice, 5-wk-old female NOD mice were treated with MB20-11 mAb (250 μg) three times at 2-wk intervals. For long-term disease incidence experiments, 5- or 15-wk-old female NOD mice were treated with three MB20-11 mAb (250 μg) injections at 2-wk intervals. Unfractionated splenocyte suspensions from NOD and C57BL/6 mice were labeled with 0.1 and 1.0 μM Vybrant CFSE, respectively, according to the manufacturer’s instructions (Invitrogen Life Technologies). The relative frequency of B220+ cells among CFSE-labeled splenocytes was determined by immunofluorescence staining with flow cytometry analysis. Subsequently, equal numbers of CFSE-labeled B220+ C57BL/6 and NOD splenocytes (4 × 107 total) were injected i.v. into NOD and C57BL/6 recipients 1 day before i.v. injection of either MB20-11 or control mAb (250 μg/mouse). After 1 day, spleen and lymph node cells were harvested with numbers of CFSE-labeled B220+ cells determined by immunofluorescence staining with flow cytometry analysis. Total RNA was isolated from spleens using the RNeasy kit (Qiagen). Random hexamer primers (Promega) and SuperScript II RNase H-Reverse Transcriptase (Invitrogen Life Technologies) were used to generate cDNA as described (38). Primers were as follows: for FcγRI, forward 5′-aaggaattcg acattacatg attcttacca gctttggag-3′, C57BL/6, reverse 5′-attgtcgaca tccctttggt ataggtctcc tttcaaatg-3′, NOD, reverse 5′-attgtcgacc tcagaaacca aagggacttc taagttgta-3′; for FcγRIII, forward 5′-atagaattcg acacccagat gtttcagaat gcacactct-3′, reverse 5′-atagtcgacg atggatgggg tgtcacttgt cttgaggag-3′; for FcγRIV, forward 5′-atagaattca tctgcttcag cagcatgtgg cagctacta-3′, reverse 5′-atagtcgacc atgcgataag agctcacttg tcctgaggt-3′; for mouse FcγRI common γ-chain, (FcRγ), forward 5′-aatagatcta gcgcacccag gatgatctca gccgtgat-3′, reverse 5′-aagggatccg tctttaacgg agatggggac ctgccagtg-3′. Full-length FcγRI, FcγRIII, FcγRIV, and FcRγ cDNAs were subsequently cloned into the pIRES2-EGFP vector (BD Clontech) and sequenced completely in both 5′ and 3′ directions using the Applied Biosystems Dye Terminator Cycle Sequencing System. Three independent FcγRIV cDNA clones were sequenced. Sequences for NOD FcγRI were as published (39). C57BL/6 FcγRI sequences were as published (GenBank accession number AK033874). NOD and C57BL/6 FcγRIII sequences were as published (GenBank accession numbers AY897426 and AY897419). Our NOD FcγRIV sequences were deposited into GenBank (EU050648). C57BL/6 FcγRIV sequences were as published (40). COS cells were cultured in DMEM (Mediatech) supplemented with 10% FBS, 2 mM glutamine, 100 U/ml penicillin, 100 μg/ml streptomycin. COS cells at 90% confluency were transiently cotransfected with FcγR (FcγRI, FcγRIII, or FcγRIV), and FcRγ expression plasmids by electroporation. Plasmid DNA (40 μg) was electroporated into 5 × 106 cells in cultured medium using a Bio-Rad Genepulser at 250 V, 960 millifarad. FcγR transcript levels were assessed by visualizing GFP expression by the transfected cells. Transfected COS cells were transferred into 24-well plates 24 h later at 1 × 105/well and cultured overnight. A total of 2 × 107 A20 cells (mouse B lymphoma cell line) were preincubated in 200 μl of culture medium containing appropriate mAbs (20 μg/ml) for 30 min on ice. After washing three times with culture medium, mAb-coated A20 cells were added (106 in 200 μl) onto the COS cell monolayers in 24-well plates with horizontal rotation at 4°C. After 60 min, unbound A20 cells were removed by extensive washing of the cell monolayers with culture medium before fixation using PBS containing 2.5% formaldehyde. A20 cell adhesion was evaluated by phase-contrast microscopy, with the number of bound A20 cells quantified for ≥10 random microscopic fields in each of three culture wells. Four days after thioglycolate injection, macrophages were purified from the peritoneal cavity by depleting CD19+ cells using MACS system following the manufacturer’s instructions (Miltenyi Biotec). Cells were resuspended (1 × 107 cells/ml) in RPMI 1640 medium (Sigma-Aldrich) containing 5% FBS and 10 mM HEPES buffer (Invitrogen Life Technologies). The cells were loaded with 1 μM Indo-1 AM ester (Molecular Probes) for 30 min at 37°C, labeled for an additional 20 min with FITC-conjugated CD11b mAb, washed, and resuspended in warm tissue-culture medium (2 × 106 cells/ml) for flow cytometry analysis. Baseline emission fluorescence ratios (405:525 nm) of CD11b+ gated cells were collected for 1 min before the addition of DNP-BSA/anti-DNP Ab immune complexes produced by incubating DNP-BSA (60 μg/ml; Biosearch Technologies) with rabbit anti-DNP IgG (90 μg/ml; Novus Biologicals) at 37°C for 2 h. Fluorescence ratios were plotted at 20-s intervals. Diabetes was monitored weekly by measuring urine glucose levels with Diastix (Bayer). Mice were diagnosed as diabetic when urine glucose levels exceeded 0.25% for two successive measurements. Urine glucose levels of 0.25% were equivalent to blood glucose values of ≥250 mg/dl as determined by an Autokit Glucose CII assay (Wako Chemicals). Insulitis was assessed by histology as described (41). Briefly, pancreata were embedded and frozen in OCT and 5 μM tissue sections were stained using H&E. Insulitis severity was scored as no infiltration, peri-insulitis (islets surrounded by a few lymphocytes), or intrainsulitis (lymphocytic infiltration into the interior of islets) as described (41). Splenocytes (1 × 107) isolated from recent diabetic NOD female mice (diabetogenic splenocytes) were mixed with equal numbers of splenocytes from untreated, CD20, or control Ab-treated (250 μg/mouse) mice in 200 μl of PBS. Cell mixtures were injected i.v. into 6- to 8-wk-old NOD.scid recipients. Mice were monitored weekly for urine glucose. After 14 days of mAb treatment, CFSE-labeled (0.1 μM) splenocytes or lymph node lymphocytes were plated in 24-well plates (2 × 106 cells) in 2 ml of RPMI 1640 complete medium with soluble CD3 mAb (2 μg/ml; 145-2C11; BD Pharmingen) plus CD28 mAb (2 μg/ml; 37.51, BD Pharmingen). After 70 h of incubation, the cultured cells were stained with CD4 or CD8 mAb to identify CFSE-labeled CD4+ and CD8+ T cells by flow cytometry. All data are shown as means ± SEM. The Student t test was used to determine the significance of differences between sample means. Disease incidence curves were compared using the log-rank test. In contrast with efficient B cell depletion in C57BL/6 mice using the MB20-11 (IgG2c) CD20 mAb, initial studies in NOD mice revealed less efficient B cell depletion (data not shown). Therefore, three CD20 mAbs representative of each IgG isotype, MB20-1 (IgG1), MB20-18 (IgG2b), and MB20-11, were assessed for their ability to deplete mature bone marrow, blood, and tissue B cells in NOD and C57BL/6 mice over a range of mAb concentrations (2–250 μg/mouse). In both mouse strains, the CD20 mAbs displayed a dose-dependent hierarchy of B cell depletion efficiencies over 7 days of treatment, while isotype- and dose-matched control mAbs were without effect (Fig. 1⇓A). At each mAb dose, the IgG2c MB20-11 mAb depleted B cells most efficiently, followed by the IgG1 CD20 mAb, with the IgG2b CD20 mAb being the least effective, as described (23, 25). Similar results were obtained for peritoneal cavity B2 cells and lymph node B cells (data not shown). As in C57BL/6 mice, bone marrow pre-B and immature (B220low) B cells were not depleted efficiently by CD20 mAbs (Table I⇓) due to absent or low CD20 expression, as described (24, 25). MB20-11 mAb potency was not an individual characteristic of this mAb, but reflected the potency of IgG2a/c CD20 mAbs in general (23). The IgG2a and IgG2c isotypes (42) are indistinguishable in their FcγR specificities (25). Thereby, when the IgG2b MB20-18 mAb was engineered to contain the IgG2a H chain, it and the IgG2c MB20-11 mAb were able to deplete B cells equally over a range of mAb doses (Fig. 1⇓B). Thus, CD20 mAbs have characteristic depletion capabilities depending on their isotypes, with IgG2a/c mAbs having greater potency than IgG1 or IgG2b CD20 mAbs (23). Reduced B cell depletion in NOD mice relative to C57BL/6 (B6) mice. A, Bone marrow (mature, B220high), blood (B220+ cells/ml), and spleen (mature, CD24+CD21+B220+) B cell numbers were determined 7 days after MB20-1, MB20-18, MB20-11, or isotype-matched control (CTL) mAb treatment of NOD or C57BL/6 mice. B, Bone marrow (mature), blood, and spleen B cell numbers were determined 7 days after IgG2c MB20-11 (○) or IgG2a MB20-18 (•), or isotype-matched control (CTL) mAb treatment of C57BL/6 mice. A and B, Values (±SEM) represent the percentage of B cells present in CD20 mAb-treated mouse tissues (n = 3) relative to control mAb-treated littermates (n = 3) at each mAb dose evaluated. Significant differences between sample means are indicated (∗, p < 0.05; ∗∗, p < 0.01). Although each CD20 mAb-depleted significant numbers of B cells in C57BL/6 mice, each mAb was significantly less efficient in NOD mice (Fig. 1⇑A). The MB20-11 mAb given at 10 μg/mouse depleted ∼98% of circulating and spleen B cells in C57BL/6 mice by day 7. By contrast, NOD mice required a 25-fold higher dose of mAb (250 μg/mouse) to remove only 90% of blood and 70% of spleen B cells. 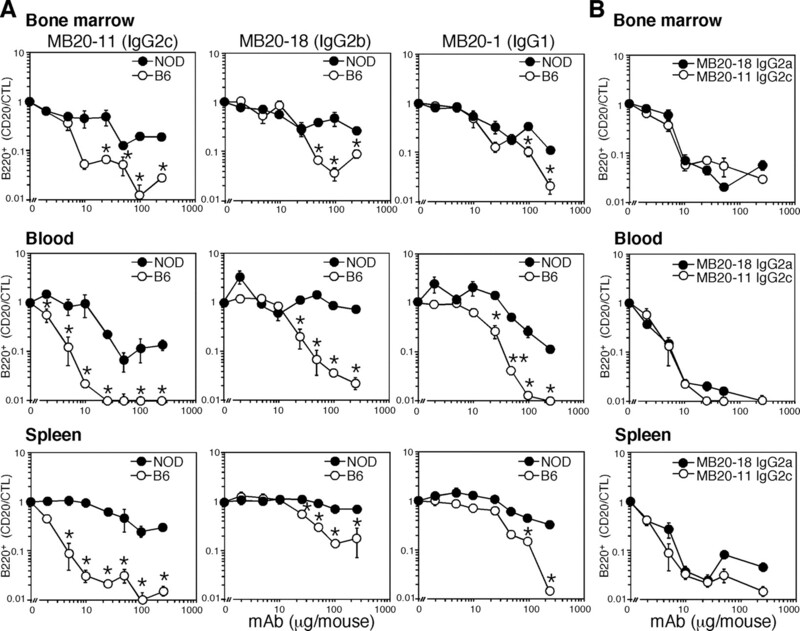 Likewise, the MB20-1 IgG1 and MB20-18 IgG2b mAbs depleted 80–90% of spleen B cells when used at 100 μg in C57BL/6 mice, whereas this mAb dose depleted only 30–60% of B cells in NOD mice. Thus, B cells in NOD mice were significantly more resistant to CD20 mAb treatment compared with C57BL/6 mice, and this deficiency was not limited to individual CD20 mAb isotypes. Whether attenuated B cell depletion in NOD mice resulted from abnormal or low-density CD20 expression by unique B cell subsets was assessed. All blood and peripheral lymph node B220+ B cells expressed CD20, with comparable expression densities in NOD and C57BL/6 mice (Fig. 2⇓A). Splenic marginal zone B cells (CD21highCD1d+B220+), T1 cells (CD21−CD24highB220+), T2 cells (CD21highCD24highB220+), and mature B cells (CD21+CD24+B220+) expressed CD20 at similar higher densities in both NOD and C57BL/6 mice (Fig. 2⇓B). CD20 was also expressed at comparable developmental stages and at similar levels by bone marrow immature IgM+B220low and mature IgM+B220high B cells (Fig. 2⇓C). Peritoneal cavity B1a (CD5+CD11b+B220low), B1b (CD5−CD11b+B220low), and B2 (CD5−B220high) cells in NOD and C57BL/6 mice also expressed CD20 similarly (Fig. 2⇓D). Thus, altered CD20 expression did not explain decreased B cell depletion in NOD mice. 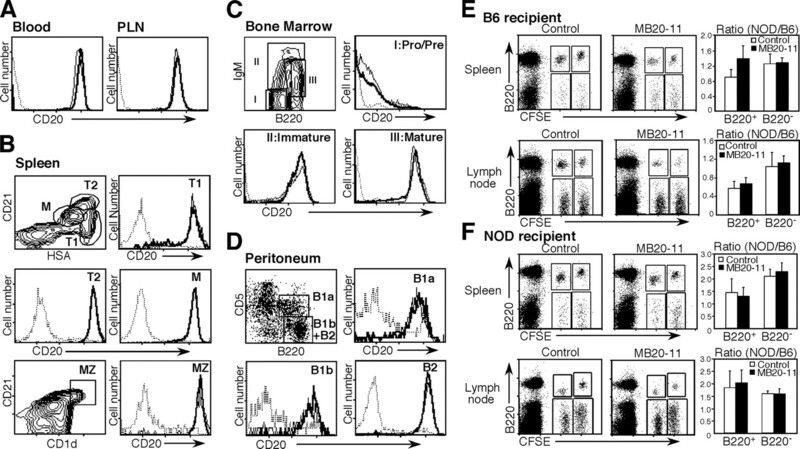 Reduced B cell depletion in NOD mice is not intrinsic to B cells. A–D, CD20 expression by B cells in NOD mice assessed by immunofluorescence staining using MB20-18 (thin line for C57BL/6, thick line for NOD mice) or isotype control (dashed line) mAbs. Single-cell suspensions of lymphocytes isolated from (A) blood and peripheral lymph nodes (PLN), (B) spleen, (C) bone marrow, and (D) the peritoneal cavity were examined by four-color flow cytometry analysis. Spleen T1, T2, mature (M), and marginal zone (MZ) B cells were defined by relative HSA and CD21 expression densities. Bone marrow pro/pre-B, immature, and mature B cells were identified by relative IgM and B220 densities. Peritoneal B1a, B1b, and B2 cells were defined by CD11b, CD5, and B220 densities. All results represent those obtained with more than or equal to three 8-wk-old NOD or C57BL/6 mice. E and F, Splenocytes from NOD and C57BL/6 mice were labeled with CFSE at different intensities, mixed equally, and injected i.p. into (E) C57BL/6 or (F) NOD recipients before treatment with MB20-11 or control (CTL) mAb (250 μg). After 24 h, spleen and peripheral lymph nodes were isolated and stained for B220 expression before flow cytometry analysis. The gates show CFSEhigh-labeled B220+ and B220− lymphocytes from C57BL/6 donor mice and CFSElow-labeled cells from NOD donor mice isolated from recipient mice. Bar graphs indicate relative ratios (±SEM) of cells from NOD and C57BL/6 donors within the CFSE-labeled B220+ and B220− lymphocyte populations. Results represent those obtained with more than or equal to three mouse pairs. Whether CD20 mAb resistance was an intrinsic property of NOD B cells was assessed by labeling NOD and C57BL/6 splenocytes with CFSE at different intensities before transfer into NOD or C57BL/6 recipients. One day following CD20 or control mAb treatments of recipient mice, the relative frequencies of CFSE-labeled B220+ and B220− lymphocytes in the spleen and lymph nodes of recipient mice were quantified by flow cytometry analysis. B220− splenocytes served as internal controls for relative numbers of transferred NOD or C57BL/6 splenocytes and to control for any variability in numbers of i.v. injected lymphocytes. CD20 mAb treatment depleted NOD and C57BL/6 B cells equally, with equivalent ratios of CFSE-labeled B220+ NOD and C57BL/6 splenocytes in C57BL/6 (Fig. 2⇑E) or NOD recipients (Fig. 2⇑F). Because the assay times were short and no differences were observed between C57BL/6 and NOD recipients with either C57BL/6 and NOD donor cells, histocompatability Ag differences were unlikely to influence the results. Thus, intrinsic B cell abnormalities did not explain decreased B cell depletion in NOD mice. Whether CD20 mAb resistance reflected an inability to deplete specific B cell subsets was assessed in NOD and C57BL/6 mice after CD20 mAb treatment. One week following CD20 or control mAb treatment of NOD mice, tissue B cell numbers were quantified by flow cytometry analysis. The majority of splenic B cells (B220+), marginal zone B cells (CD21highCD1d+B220+), T1 cells (CD21−CD24highB220+), T2 cells (CD21highCD24high B220+), and mature B cells (CD21+CD24+B220+) were depleted in both NOD and C57BL/6 mice (Table I⇑). Most peripheral lymph node B cells (B220+) were also depleted in both NOD and C57BL/6 mice. Peritoneal cavity B1a (CD5+ CD11b+B220low), B1b (CD5−CD11b+B220low), and B2 (CD5−B220high) cells in NOD and C57BL/6 mice were also depleted similarly. Furthermore, B220− lymphocyte numbers were not affected by CD20 mAb treatment. Thus, decreased B cell depletion in NOD mice was a general defect that was not restricted to specific B cell subsets. Because CD20 mAb-mediated B cell depletion is FcγR dependent (23), FcγR expression and amino acid sequences were examined in NOD mice. Thioglycolate-elicited peritoneal CD11b+F4/80+ macrophages from NOD mice expressed FcγRII/III epitopes identified by the 2.4G2 mAb at 40% lower levels than macrophages from C57BL/6 mice as determined by immunofluorescence staining with flow cytometry analysis (Fig. 3⇓A). A smaller but reproducible decrease in FcγRII/III expression by spleen monocytes from NOD mice was also observed relative to spleen monocytes from C57BL/6 mice. However, FcγRIII transcript levels in NOD and C57BL/6 peritoneal macrophages were similar when analyzed by semiquantitative RT-PCR analysis (data not shown). Thus, reduced 2.4G2 mAb staining in NOD mice was most likely due to reduced FcγRII expression, as described (43). By contrast, FcγRIV expression by peritoneal and spleen CD11b+F4/80+ monocytes was similar in NOD and C57BL/6 mice, as determined using the 9G8.1 mAb (34). Thus, reduced ADCC in NOD mice was not due to reduced FcγRIII or FcγRIV expression. FcγR expression and function in NOD mice. A, FcγRII/III and FcγRIV expression by spleen and thioglycolate-elicited peritoneal CD11b+F4/80+ monocytes from NOD (thick line) and C57BL/6 (thin line) mice. Dashed lines indicate control mAb staining. Representative results from one of three experiments is shown. B, Predicted FcγRIII and FcγRIV protein sequences for NOD and C57BL/6 mice. Identical residues are denoted with a dash. Differences in amino acid sequences are boxed. Residue numbering is as published (GenBank accession numbers: AY897419, AY897426, NM_144559, and EU050648). Extracellular domain 1 (EC1) and the cytoplasmic (CYTO) domains are shown. C and D, FcγR function. Binding of CD20 mAb-coated or untreated (Medium) A20 cells to COS cells transiently cotransfected with FcγR (FcγRI, FcγRIII, FcγRIV) and FcRγ-subunit cDNAs. Values represent mean (±SEM) numbers of A20 cells bound to COS cells in at least 30 fields from three independent experiments. Significant differences between sample means for CD20 mAb-coated and untreated A20 cells are indicated (∗, p < 0.05; ∗∗, p < 0.01). D, Representative A20 cell binding to COS cells transfected with FcγRI from NOD or C57BL/6 mice. E, IgG-immune complexes induce equal [Ca2+]i response in Indo-1-loaded macrophages from NOD (thick line) and C57BL/6 (thin line) macrophages. Changes in [Ca2+]i were quantified by flow cytometry with immune complexes added at the time point indicated (arrow). These results are representative of three experiments. FcγR polymorphisms were also examined in NOD mice. NOD FcγRI transcripts differed from C57BL/6 transcripts by 24 nucleotides within coding regions, 17 of which encoded different amino acids including a four amino acid insertion between domains 2 and 3, and a frame shift that lead to premature truncation of the cytoplasmic domain (data not shown), as described (44, 45). FcγRIII and FcγRIV polymorphisms were also observed in coding regions from NOD mice. Four amino acid substitutions were identified in the FcγRIII extracellular and cytoplasmic domains (Fig. 3⇑B), as described (GenBank accession number: AY897426). One polymorphic residue was identified in FcγRIV, which led to an amino acid change in extracellular domain 1. FcγRI, FcγRIII, and FcγRIV require FcRγ for assembly and ADCC effector mechanisms (32). However, NOD and C57BL/6 FcRγ transcripts were identical (data not shown), despite the amino acid sequence differences found in FcγRI, FcγRIII, and FcγRIV. To determine whether the FcγR sequence differences were functionally significant, COS cells transiently expressing FcγRs from NOD and C57BL/6 mice were analyzed for their ability to bind mouse A20 B lymphoma cells coated with CD20 mAbs in vitro. A20 cell binding to COS cells was visualized by light microscopy. COS cells expressed equivalent levels of NOD and C57BL/6 FcγRI transcripts as verified by semiquantitative RT-PCR analysis (data not shown). Equivalent FcγRIII and FcγRIV transcription by transfected COS cells was verified by flow cytometry analysis, as each FcγR expression plasmid contained an internal ribosomal entry site-GFP expression cassette downstream of the FcγR cDNA insert. Specifically, 50–60% of the COS cells expressed GFP, with similar fluorescence intensities. COS cells expressing C57BL/6 FcγRI bound IgG2a CD20 mAb-bearing A20 cells at significant levels (127 ± 13 cells/field), whereas cells expressing NOD FcγRI did not bind IgG2a CD20 mAb (9 ± 1 cells/field; p < 0.001, Fig. 3⇑, C and D). C57BL/6 FcγRI did not bind IgG1 or IgG2b CD20 mAbs in vitro. By contrast, COS cells expressing FcγRIII from either NOD or C57BL/6 mice bound A20 cells coated with IgG1, IgG2a, or IgG2b CD20 mAbs similarly. COS cells expressing NOD or C57BL/6 FcγRIV also bound IgG2a and IgG2b isotype CD20 mAbs equally, but did not bind IgG1 CD20 mAb. Thus, NOD FcγRI did not bind IgG2a mAbs efficiently when compared with C57BL/6 FcγRI, while NOD and C57BL/6 FcγRIII and FcγRIV were equivalent in their CD20 mAb-binding properties. Although the pathways regulating macrophage FcγR signaling during ADCC are poorly defined, immune complex-mediated FcγR cross-linking induces a slow increase in intracellular calcium levels ([Ca2+]i) as described (32, 46). Therefore, DNA-BSA/anti-DNP IgG immune complex-induced changes in [Ca2+]i by peritoneal macrophages from NOD and C57BL/6 mice were compared to determine whether global defects in FcγR signaling explained reduced ADCC in NOD mice. However, induced [Ca2+]i levels were similar if not identical in both NOD and C57BL/6 mice, suggesting intact FcγR signaling in NOD mice (Fig. 3⇑E). Using a panel of CD20 mAbs of different isotypes, previous studies demonstrated that IgG2a CD20 mAbs required FcγRIV and potentially FcγRI for B cell depletion in vivo, while FcγRIII deficiency was without effect (23, 25). IgG2b CD20 mAbs preferentially used FcγRIV, and IgG1 mAbs used FcγRIII exclusively. To rule out the influence of mAb binding or affinity/avidity differences, the MB20-18 mAb was used to generate IgG1, IgG2a, and IgG2b mAbs with identical V regions so that the influence of mAb isotype on FcγR use could be assessed directly. Under these conditions, the IgG2a MB20-18 mAb was most potent for depleting B cells in C57BL/6 mice, while the IgG1 MB20-18 mAb was more potent than the IgG2b MB20-18 mAb (Fig. 4⇓). 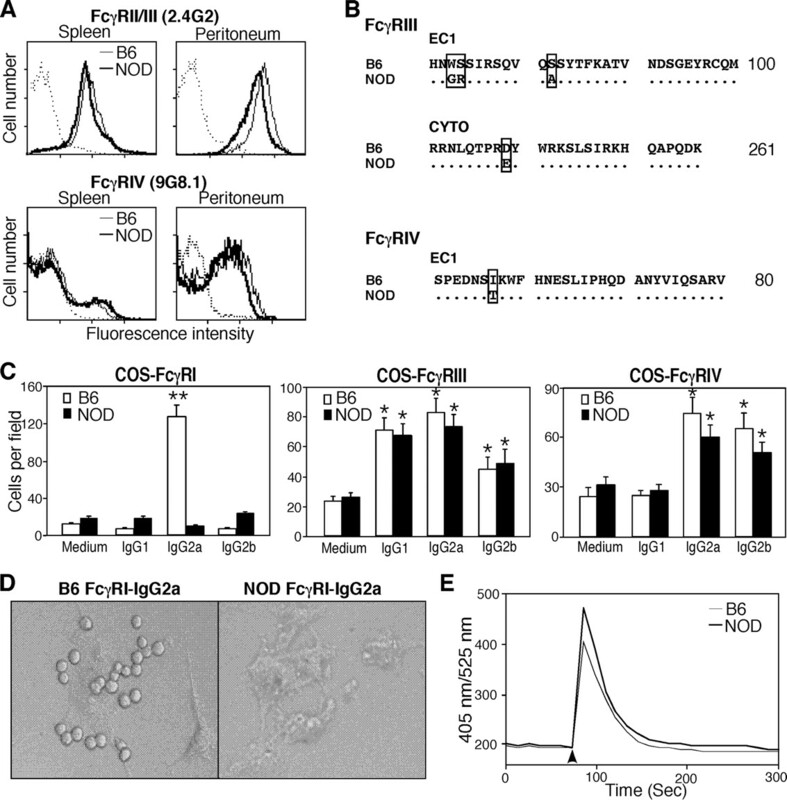 FcγRI is required for IgG2a CD20 mAb-mediated B cell depletion in vivo. Blood and spleen B cell depletion in C57BL/6 FcγRI/III−/− (filled circles), C57BL/6 (open circles) and NOD (shaded circles) mice. FcγRI/III−/− and C57BL/6 mice were treated using the IgG2a MB20-18, IgG2b MB20-18, and IgG1 MB20-18 CD20 mAbs, while NOD mice were treated using the IgG2c MB20-11, IgG2b MB20-18, and IgG1 MB20-1 mAbs. Values (±SEM) indicate the percentage of B cells present in mAb-treated mice (n = 6 for 10 μg/mouse, n = 3 for other doses) relative to control (CTL) mAb-treated littermates at each mAb dose evaluated. Significant differences between sample means of FcγRI/III−/− and C57BL/6 mice (∗, p < 0.05), or FcγRI/III−/− and NOD mice (†, p < 0.05) are indicated. FcγRI/III−/− double-deficient C57BL/6 mice were also generated and compared with wild-type mice for CD20 mAb-mediated B cell depletion using the IgG2a, IgG1, and IgG2b MB20-18 mAbs. Thereby, mice expressing only FcγRIV were compared directly with mice expressing FcγRI, FcγRIII, and FcγRIV. For the IgG2a CD20 mAb at 250 μg/mouse, B cell depletion was complete in both wild-type and FcγRI/III−/− mice (Fig. 4⇑). However, at lower IgG2a CD20 mAb doses, the IgG2a mAb depleted significantly more B cells in wild-type mice. For example, IgG2a CD20 mAb (10 μg/mouse) only reduced circulating and spleen B cell numbers by 67 and 52% in FcγRI/III−/− mice, respectively, while reducing B cell numbers by >95% in wild-type mice. Thus, CD20 mAb-mediated B cell depletion was significantly less efficient when only FcγRIV was expressed, demonstrating that FcγRI and/or FcγRIII were also required for optimal B cell depletion. Circulating and spleen B cells were depleted similarly by IgG2b CD20 mAb in both wild-type and FcγRI/III−/− mice, confirming that IgG2b CD20 mAbs can use FcγRIV efficiently in the absence of FcγRI. Spleen B cells were not depleted by the IgG1 CD20 mAb in FcγRI/III−/− mice, consistent with IgG1 mAbs using FcγRIII exclusively for CD20 mAb-mediated B cell depletion. However, the IgG1 CD20 mAb depleted 40–60% of circulating B cells in FcγRI/III−/− mice, suggesting that FcγR-dependent and -independent pathways contribute to circulating B cell clearance by CD20 mAb, as described (25). When blood and tissue B cell depletion in NOD and FcγRI/III−/− mice were compared over a range of IgG2a/c and IgG2b CD20 mAb doses, B cell depletion was similar at most mAb doses (Fig. 4⇑). Thus, the absence of normal FcγRI function in NOD mice explains the significant in vivo defect in IgG2a CD20 mAb-mediated B cell depletion. Spleen monocyte numbers were significantly reduced (60 ± 3%, p < 0.01, n = 5) in NOD mice compared with age-matched C57BL/6 mice. To assess whether monocyte activation could compensate for reduced monocyte numbers and enhance B cell depletion in vivo, NOD and C57BL/6 mice were each treated i.p. with thioglycolate to induce systemic macrophage activation and migration into the peritoneal cavity over a 24- to 48-h period, as described (47). One day after thioglycolate treatment, mice were given suboptimal doses of MB20-11 (25 μg), MB20-18 (100 μg), and MB20-1 (250 μg) mAb, with blood and tissue B cell numbers analyzed 7 days later. In mice treated with an IgG2c CD20 mAb, thioglycolate treatment did not enhance blood, spleen, or lymph node depletion in NOD mice, while B cells were depleted efficiently in C57BL/6 mice without thioglycolate treatment (Fig. 5⇓). Within the peritoneal cavity, thioglycolate treatment resulted in a 58% decrease in B cell numbers in NOD mice, with a 98% decrease in C57BL/6 mice relative to littermates that were not treated with thioglycolate. In mice treated with IgG1 and IgG2b CD20 mAbs, circulating B cells were depleted by 56% (IgG1) and 2% (IgG2b) without thioglycolate treatment, but 81% (IgG1) and 47% (IgG2b) with thioglycolate treatment at day 7. Thioglycolate treatment did enhance B cell depletion in lymph nodes of NOD mice, but most significantly reduced peritoneal cavity B cell numbers in both NOD and C57BL/6 mice. Thus, B cell depletion in both NOD and C57BL/6 mice was accelerated by monocyte activation regardless of CD20 mAb isotype, arguing that ADCC could be induced in NOD mice, although at reduced levels compared with C57BL/6 mice. Thus, reduced monocyte numbers and deficient FcγRI function are likely to explain reduced B cell depletion in NOD mice rather than defective monocyte activation. Thioglycolate treatment augments B cell depletion in NOD mice. Blood (B220+), spleen (CD24+CD21+B220+), lymph node (B220+), and peritoneal cavity B2 (CD5−B220high) cell depletion with (filled circles/squares/bars) or without (open circles/squares/bars) thioglycolate treatment. Mice were treated using the IgG2c MB20-11 (25 μg), IgG1 MB20-1 (250 μg), IgG2b MB20-18 (100 μg), or isotype- and dose-matched control mAbs. 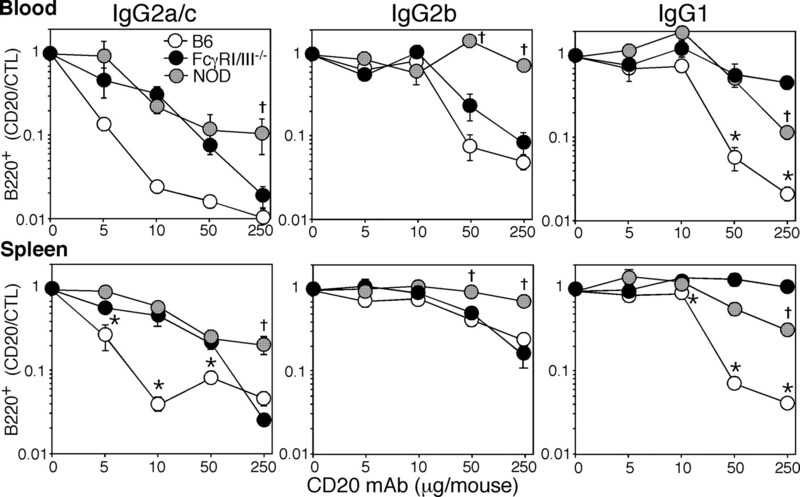 Values (±SEM) represent the percentage of B cells present in CD20 mAb-treated mice (n = 5 for IgG2c; n = 3 for IgG2b and IgG1) relative to control (CTL, n = 3) mAb-treated littermates. Significant differences between sample means of mice treated with and without thioglycolate are indicated: ∗, p < 0.05. Despite reduced ADCC in NOD mice, B cells were nonetheless effectively depleted by high-dose IgG2c CD20 mAb treatment (Fig. 1⇑). Therefore, 5-wk-old female NOD mice were treated with CD20 mAb (250 μg) given biweekly over 6 wk (Fig. 6⇓A). Circulating B cell numbers remained reduced by >95% for up to 12 wk of age, but began to normalize thereafter. Circulating B cell numbers did not change in untreated littermates or littermates treated with an isotype-matched control mAb. Likewise, a single CD20 mAb treatment at 5 wk of age depleted the majority of spleen, pancreatic lymph node, and mesenteric lymph node B cells in 8-wk-old mice, with >95% fewer B cells within the islets of these mice (Fig. 6⇓B). Thus, B cell depletion was significant and durable in NOD mice following high-dose CD20 mAb treatment. B cell depletion protects NOD mice against T1D. A, Blood B cell depletion in female NOD mice. The frequency of blood B cells was measured over time in untreated NOD mice (squares, n = 4) or littermates treated three times (weeks 5, 7, and 9, arrows) with MB20-11 (circles; n = 5) or control (triangles; n = 5) mAb (250 μg). B, Tissue B cell depletion in female NOD mice. The frequency of B cells in spleen, PanLN (pancreatic lymph node), MLN (mesenteric lymph node), and islets was measured in 8-wk-old NOD mice (n = 2) 3 wk after a single injection of MB20-11 (▪) or control (▦) mAb (250 μg) or in untreated littermates (□). Significant differences between sample means are indicated: ∗∗, p < 0.01. C–F, B cell depletion delayed diabetes onset and progression in NOD mice. C–E, Five-week-old or, F, 15-wk-old female NOD female mice were treated biweekly three times (arrows) with MB20-11 (circles) or control (triangles) mAb (250 μg) and monitored for diabetes in comparison with untreated littermates (squares). C, Values represent results using groups of 11 littermate mice for the respective experimental groups. D, Pancreatic insulitis was assessed in 14-wk-old NOD mice 5 wk after the last injection of CD20 or control mAb compared with untreated littermates. A minimum of 20 islets was counted for each mouse, with five mice per group. E, Pancreatic lymphocyte frequencies were assessed in 17-wk-old NOD mice 8 wk after the last injection of CD20 or control mAb compared with untreated littermates. Results represent frequencies of CD19+ B cells and CD4+ or CD8+ T cells as assessed by flow cytometry. Islets were pooled from groups of four mice and cultured overnight in medium containing IL-2 (4 ng/ml). All data were normalized per 100 islets. F, Values represent results using seven MB20-11 and eight control mAb-treated littermates. The impact of B cell depletion on diabetes progression was assessed using 5-wk-old NOD female mice that were untreated, or treated biweekly three times with high-dose CD20 or control mAb, with disease onset and incidence monitored for up to 53 wk. The majority of CD20 mAb treated NOD mice (7 of 11) remained diabetes free, while all of the untreated (n = 11) or control mAb-treated mice (n = 11) developed diabetes (Fig. 6⇑C). Moreover, B cell depletion significantly reduced the frequency of intrainsulitis when compared with untreated or control mAb-treated littermates when assessed at 14 wk of age (p < 0.05; Fig. 6⇑D). In CD20 mAb-treated mice, 32% of islets were free of insulitis with only 12% of the islets heavily infiltrated (e.g., >50% intrainsulitis). By contrast, the majority (e.g., >50%) of islets were heavily infiltrated in untreated or control mAb-treated mice. In a cohort of mice treated similarly, the number of lymphocytes within islets of 17-wk-old mice was reduced by 65% after CD20 mAb treatment (Fig. 6⇑E). However, the relative frequencies of CD19+ B cells and CD4+ and CD8+ T cells was similar in untreated, and CD20 or control mAb-treated mice (Fig. 6⇑E). Thus, the return of circulating B cells at 13 wk in NOD mice (Fig. 1⇑A) was likely to parallel the return of tissue B cells, as occurs in C57BL/6 mice (23, 24), with normalized B cell compartments by 17 wk. Nonetheless, the absence of B cells during the period of normal disease development in NOD mice significantly reduced the severity of insulitis and the frequency of lymphocytes migrating into islets, with most CD20 mAb-treated mice remaining disease free for up to 53 wk. To test whether CD20 mAb treatment at a later preclinical stage of T1D was also effective, 15-wk-old female NOD mice were treated three times with CD20 mAb (weeks 15, 17, 19), with diabetes monitored for up to 40 wk. B cell depletion did not prevent 15-wk-old mice from developing diabetes, but diabetes onset was significantly delayed following CD20 mAb treatment when compared with control mAb-treated littermates (p < 0.05, Fig. 6⇑F). Collectively, B cell depletion either prevented or delayed the progression of T1D in NOD mice, depending on the stage of β cell autoimmunity. Others have demonstrated generally impaired lymph node T cell activation in congenitally B cell-deficient NOD mice, suggesting a critical need for B cell costimulatory signals within these microenvironments (48). Therefore, the effects of B cell depletion on T cell numbers, phenotypes, and proliferative capacity was assessed in NOD mice given CD20 or control mAb at 5 wk of age. Two weeks after CD20 mAb treatment, B cell numbers were significantly reduced, but CD4+ and CD8+ T cell numbers were not changed in the spleen, or pancreatic and peripheral lymph nodes (Table I⇑). Similarly, CD4+ and CD8+ T cell expression of cell surface markers indicative of activation and memory cell development were not changed following CD20 mAb treatment for 2 wk. This included CTLA-4, CD28, CD44, CD62L, CD69, CD154, and OX-40 expression within the spleen, and peripheral and pancreatic lymph nodes (Fig. 7⇓A and data not shown). By contrast, the ability of NOD pancreatic and peripheral lymph node CD4+ and CD8+ T cells to proliferate in response to CD3 plus CD28 costimulation in vitro was significantly reduced by CD20 mAb treatment in vivo (Fig. 7⇓B). Furthermore, splenic CD4+, but not CD8+ T cell, proliferation in response to CD3 plus CD28 costimulation was also affected by CD20 mAb treatment, but to a lesser extent. Thus, induced B cell depletion did not have global effects on the numbers or phenotypes of either CD4+ or CD8+ T cells, but significantly reduced the proliferative capacity of CD4+ and CD8+ T cells within the lymph nodes of NOD mice. B cell depletion effects on T cell phenotypes, mitogen responses, and suppressor cell frequencies in NOD mice 14 days after CD20 or control mAb treatment. A, Spleen CD4+ and CD8+ T cell phenotypes after B cell depletion. Histograms represent T cell expression of activation molecules after CD20 (thick line) or control (thin line) mAb treatments. Dashed lines represent control mAb reactivity. B, CD4+ and CD8+ T cell proliferation after B cell depletion. Splenocytes, and peripheral (PLN) and pancreatic (PanLN) lymph node cells from CD20 or control mAb-treated mice were isolated 2 wk after mAb treatment, CFSE labeled, and stimulated in vitro with CD3 plus CD28 mAbs (thick line) or medium alone (dashed line) for 70 h. Diminished CFSE intensity indicative of proliferation was assessed for mAb-labeled CD4+ and CD8+ T cells by flow cytometry. Representative CFSE profiles are shown (left panels). Right panels, CFSE geometric mean fluorescence (control (□) and CD20 (▪) mAb-treated mice), which is inversely proportional to cell divisions. A and B, Histograms representative of results obtained with more than or equal to three mice in each group are shown; ∗, p < 0.05 and ∗∗, p < 0.01; CD20 vs control mAb-treated groups. C, Regulatory/suppressor cells were not induced by B cell depletion. Splenocytes from diabetic NOD female mice were isolated and mixed equally with splenocytes from CD20 (circles) or control (triangles) mAb-treated 14-wk-old NOD female mice. Splenocytes were transferred into groups of five 6–8-wk-old NOD.scid mice, with diabetes monitored weekly. In lupus patients, B cell depletion is proposed to result in regulatory or suppressor T cell generation (49, 50). To assess this, splenocytes from diabetic NOD mice were mixed with splenocytes from CD20 or control mAb-treated NOD mice and coadoptively transferred into NOD.scid recipients. The adoptive transfer of splenocytes from diabetic and control mAb-treated NOD donors into NOD.scid mice resulted in median diabetes onset 5 wk postcell transfer. The time of onset and the frequency of diabetes were not significantly affected, however, in NOD.scid mice receiving splenocytes from CD20 mAb-treated and diabetic NOD mice (Fig. 7⇑C). Consistent with this, the numbers of spleen and lymph node CD25+FoxP3+CD4+ regulatory T cells were not changed in NOD (Table I⇑) or in C57BL/6 mice (19). Thereby, B cell depletion did not significantly promote regulatory/suppressor T cell function in NOD mice. B cells have multiple roles in the development and organization of the immune system and play key, albeit ill-defined, roles in driving β cell autoimmunity. Several studies indicate that B cells can serve as APCs or prime β cell-specific T cells (16, 17, 18, 19). Consequently, targeting B cells offers a potential approach to modulate β cell-specific autoimmunity. With this in mind, the current study was initiated to assess the efficacy of CD20 mAb treatment in depleting B cells and preventing diabetes in NOD female mice with intact immune systems. The data demonstrate that NOD mice are resistant to the depleting effects of different isotypes of CD20 mAbs relative to C57BL/6 mice, and that this resistance is in part due to altered FcγRI function and reduced monocyte numbers (Figs. 1⇑ and 3⇑). Despite this defect, high-dose CD20 mAb administration transiently depleted B cells and could prevent diabetes onset in 5-wk-old, but not 15-wk-old, NOD female mice (Fig. 6⇑, C and F). Likewise, induced B cell depletion in vivo significantly inhibited lymph node CD4+ and CD8+ T cell activation in vitro (Fig. 7⇑B). Continuous B cell depletion in newborn NOD mice by anti-mu Ab or genetically induced B cell deficiency results in no or limited insulitis, and the absence of diabetes (10, 11, 12). By contrast, this study is the first to demonstrate that CD20 mAb depletion in NOD mice with intact immune systems also limits insulitis and diabetes (Fig. 6⇑, C–E). Remarkably, B cell depletion in 5-wk-old NOD female mice, a time at which β cell autoimmunity has been initiated, effectively prevented diabetes in >60% of treated littermates (Fig. 6⇑C) despite the reappearance of B cells by 14 wk of age (Fig. 6⇑A). Protection induced by B cell depletion also paralleled a significant delay in insulitis progression (Fig. 6⇑D) and a significant reduction in B and T cell numbers within islets of 17-wk-old NOD mice (Fig. 6⇑E). These results and the finding that CD20 mAb treatment inhibited CD4+ and CD8+ T cell activation suggests that B cells are most important for disease initiation, with B cell recovery after depletion potentially reinitiating disease progression as occurs in collagen-induced arthritis (28). A role for B cells in disease initiation explains the limited efficacy of B cell depletion in 15-wk-old NOD mice (Fig. 6⇑F) that represent a late preclinical stage of T1D. The mechanism by which B cell depletion alters β cell autoimmunity is likely to involve multiple factors. Prominent among these mechanisms may be the finding that B cell depletion in vivo significantly attenuates foreign- and autoantigen-specific CD4+ T cell proliferation in vivo in C57BL/6, DBA-1, and NOD mice (19). For instance, proliferation of transferred BCD2.5 transgenic CD4+ T cells is significantly reduced in the pancreatic lymph nodes of NOD recipients depleted of B cells via CD20 mAb treatment (48). 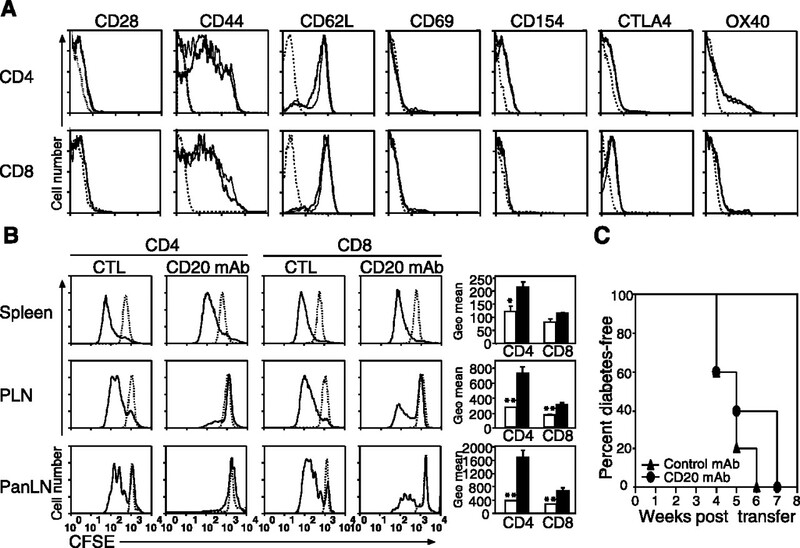 Similarly, induced B cell depletion attenuated lymph node CD4+ and CD8+ T cell proliferation in vitro (Fig. 7⇑B). By contrast, B cell depletion does not induce a generalized state of T cell immunosuppression or attenuate T cell responses to Ags once induced, or affect naive or memory T cell, or immunoregulatory T cell numbers within the spleen or lymph nodes (19). Likewise, induced B cell deficiency in NOD mice did not affect CD4+ or CD8+ T cell numbers (Table I⇑), alter their cell surface activation markers, or naive and memory phenotypes (Fig. 7⇑A). Furthermore, CD20 mAb treatment did not alter regulatory T cell numbers (Table I⇑) or induce a sufficient frequency of immunoregulatory T cells to suppress the diabetogenic capacity of established effector T cells in coadoptive transfer experiments (Fig. 7⇑C). These collective data and the limited efficacy of B cell depletion in 15-wk-old NOD female mice (Fig. 6⇑F) indicate that B cell depletion significantly attenuates β cell-specific T cell priming, with less of an effect once significant numbers of β cell-specific T effectors are established. However, B cells may also be required for the recruitment of T cell clones with additional specificities as autoimmunity progresses or for avidity maturation of key pathogenic T cell clonotypes. Avidity maturation of CD8+ T cell clones specific for islet-specific glucose-6-phosphatase catalytic subunit-related protein 206–214 correlates with the progression of T1D in NOD mice (51). Thereby, in the absence of B cells, previously generated autoreactive T cells may continue to be stimulated and infiltrate the islets, but the repertoire of these effectors may be limited and unable to promote efficient β cell destruction. This scenario likely explains why B cell depletion in 15-wk-old NOD female mice was at least partially effective in delaying disease onset (Fig. 6⇑F). As in the current study, induced B cell depletion early during disease onset significantly delays or prevents disease in mouse models of rheumatoid arthritis and systemic sclerosis, but not after autoimmunity is established (26, 28). B cell depletion may also remove mature autoreactive B cells. Indeed, B cells expressing insulin-specific Ag receptors develop accelerated diabetes (52), while the expression of a fixed transgenic Ag receptor delays diabetes onset (53). B cells may also provide necessary costimulatory signals or cytokines, or generate the appropriate microenvironment for pathogenic T cell expansion at important checkpoints of disease progression. For instance, a qualitative change in insulitis occurs at 12 wk of age in NOD female mice that drives efficient β cell destruction (54). NOD mice treated with CD20 mAb at 5 wk of age are still B cell deficient at 12 wk of age, which may have delayed transition through this checkpoint. Nonetheless, CD20+ B cell depletion does not eliminate circulating Abs or autoantibodies, or long-lived plasma cells in mice (26, 28, 55) so it remains possible that autoantibodies also contribute to disease pathogenesis once established. Circulating and tissue B220+ B cell depletion was reduced in NOD mice compared with CD20 mAb-mediated B cell depletion in C57BL/6 mice (Fig. 1⇑). Resistance to CD20 mAb-mediated depletion was not due to reduced CD20 expression or an intrinsic feature of NOD B cells (Fig. 2⇑), but reflected defects in NOD FcγRI and reduced macrophage numbers. The effectiveness of CD20 mAb-induced B cell depletion correlated closely with mAb isotype, with IgG2a/c>IgG1>IgG2b mAbs in both NOD and C57BL/6 mice (Fig. 1⇑). This hierarchy was reinforced using isotype-switched IgG2a and IgG1 variants of an IgG2b CD20 mAb, where all mAbs shared Ag-binding V regions (Fig. 4⇑). However, NOD mice expressed a unique FcγRI allele that differs significantly from C57BL/6 FcγRI, as described (39). Transfected COS cells expressing NOD-FcγRI failed to bind IgG2a, IgG2b, or IgG1 CD20 mAb-coated A20 cells at significant levels (Fig. 3⇑, C and D). NOD blood CD11b+ cells also express cell surface FcγRI at lower levels than C57BL/10SnJ macrophages (44). Thus, decreased IgG2a CD20 mAb potency and ADCC in NOD mice could be attributed to functional defects in FcγRI, particularly when mAb doses were limiting in vivo (Fig. 1⇑). FcγRI is thought to play a minor role in most in vivo circumstances because administered mAbs must compete with intrinsic circulating Abs that are retained by this high-affinity receptor. However, the in vivo dependence of IgG2a mAbs on FcγRI function has been observed in other experimental systems (56, 57, 58), in addition to CD20 mAb-mediated B cell depletion (25). In C57BL/6 mice, high-affinity FcγRI preferentially binds IgG2a CD20 mAbs, whereas FcγRIV binds with intermediate affinity to IgG2a and IgG2b CD20 mAbs, while FcγRIII binds with low affinity to IgG2a, IgG1, and IgG2b CD20 mAbs in vitro (Fig. 3⇑C, Ref. 33). However, FcγRIV expression alone in FcγRI/III−/− C57BL/6 mice was not sufficient for optimal IgG2a CD20 mAb-mediated B cell depletion (Fig. 4⇑), arguing for FcγRI, FcγRIII, and FcγRIV binding of IgG2a CD20 mAbs in vivo. Moreover, the ability of IgG2a and IgG2b CD20 mAbs to bind FcγRIV equally, while IgG2b mAbs did not bind FcγRI (Fig. 4⇑), provides an explanation for the modest depletion abilities of IgG2b CD20 mAbs when compared with IgG2a/c mAbs in either NOD or C57BL/6 mice. This result contrasts with a recent study where Ab-mediated tumor clearance and platelet depletion were unaltered in FcγRI−/− mice, while blocking FcγRIV function with a specific mAb significantly reduced these IgG2a-mediated activities (34). Regardless, in NOD or FcγRI/III−/− mice, IgG2a CD20 mAbs remained more potent for B cell depletion than IgG2b CD20 mAbs (Figs. 1⇑ and 4⇑). However, IgG2b mAbs engage inhibitory FcγRII better than IgG2a mAbs (31, 59) and may therefore appear less potent in vivo because FcγRII can inhibit CD20 mAb-induced B cell depletion (25). Thus, IgG2a CD20 mAbs are intrinsically potent in mice due to their ability to bind FcγRI, FcγRIII, plus FcγRIV, with reduced potency in NOD mice due to the absence of FcγRI function. The importance of FcγR-dependent ADCC in B cell depletion was reinforced in the current studies. Normally, IgG2b CD20 mAbs have minimal B cell-depleting activity in vivo (23, 25). However, switching an IgG2b CD20 mAb to the IgG2a and IgG1 isotypes resulted in mAbs that were as potent as other independent IgG2a and IgG1 CD20 mAbs (Figs. 1⇑ and 4⇑). This argues that mAb isotype, FcγR-mediated ADCC, or other Fc-mediated activities are of primary importance for B cell depletion compared with signals generated within B cells following mAb binding to CD20. As in NOD mice, mAb interactions with FcγRs is an important factor influencing the efficacy of rituximab for human therapy. Polymorphisms in human FcγRIIa and FcγRIIIa correlate with the efficiency of B cell and tumor depletion during CD20 mAb therapy in lupus and lymphoma patients (60, 61, 62). FcγRIIa is predominantly expressed by human macrophages and DCs, while FcγRIIIa is predominantly expressed by macrophages and NK cells. FcγRIIIa polymorphisms are predictive of tumor clearance in follicular lymphomas (60, 62), where ADCC appears critical. In NOD mice, FcγRIV and FcγRIII compensated for inadequate FcγRI function and mediated B cell depletion with high-dose CD20 mAb treatment. The FcγRI polymorphism and defective effector cell function demonstrated by NOD mice may thereby provide a model for studying molecular mechanisms of resistance to mAb therapy in patients. Spleen monocyte numbers were reduced by 60% in NOD mice when compared with age-matched C57BL/6 mice, as described (63), thereby limiting the ADCC effector cell capacity of NOD mice. Consistent with this, decreased monocyte numbers in C57BL/6 mice following clodronate treatment reduces CD20 mAb-mediated B cell depletion to only ∼40% clearance by day 7 (23). In NOD mice, reduced monocyte numbers reflect a failure to fully differentiate in response to CSF-1 and IFN-γ exposure (64), reduced apoptotic cell phagocytosis (65), and impaired recruitment of leukocytes into sites of inflammation due to defects in CCL2-induced migration (66). Defective ADCC in NOD mice did not result from elevated serum IgG because serum IgM and IgG levels were comparable in the 4- to 8-wk-old NOD and C57BL/6 mice used for depletion studies (data not shown). In addition, CD20 mAb treatment does not reduce serum IgM or IgG levels, or preformed Ag-specific Ab levels (55). Despite reduced ADCC in NOD mice, defective B cell depletion was overcome by administering higher doses of CD20 mAb, which resulted in effective B cell depletion (Figs. 1⇑ and 6⇑, A and B). In addition, thioglycolate treatment induced effector cell recruitment and increased B cell depletion in NOD mice (Fig. 5⇑). IgG-containing immune complexes also induced comparable [Ca2+]i responses in NOD and C57BL/6 macrophages (Fig. 3⇑E), suggesting that downstream FcγR signaling was not significantly impaired in NOD macrophages. Thereby, increasing the relative concentration of therapeutic mAbs relative to endogenous IgG appears to be a valid strategy for overcoming FcγR and ADCC defects in NOD mice. In summary, these data demonstrate the effectiveness of preemptive CD20 mAb-mediated B cell depletion in treating diabetes in NOD mice with intact immune systems. This provides a rationale for applying similar approaches to the management of prediabetic patients and patients with recent onset disease. Moreover, the finding that high-dose CD20 mAb treatment can overcome the effects of defective FcγR function in vivo provides a rationale for applying similar approaches for oncology and autoimmune disease patient management. We thank Ann Miller and Jennifer Martinez for their help with these studies, Drs. Karen M. Haas and Jonathan Poe for their helpful suggestions and critical review of this manuscript, and Dr. Jeffrey Ravetch for providing reagents and mice. T. F. Tedder is a paid consultant for MedImmune and Angelica Therapeutics. ↵1 This work was supported by National Institutes of Health Grants CA105001, CA96547, and AI56363 (T.F.T. ), and AI058014 (R.M.T.). C.P.W. was supported by a Fellowship from the Juvenile Diabetes Research Foundation. ↵2 Y.X. and C.P.W. contributed equally to these studies and share first authorship. ↵3 R.M.T. and T.F.T. contributed equally to these studies and share senior authorship. ↵5 Abbreviations used in this paper: T1D, type 1 diabetes; ADCC, Ab-dependent cellular cytotoxicity; [Ca2+]i, intracellular calcium level. Shoda, L. K., D. L. Young, S. Ramanujan, C. C. Whiting, M. A. Atkinson, J. A. Bluestone, G. S. Eisenbarth, D. Mathis, A. A. Rossini, S. E. Campbell, et al 2005. A comprehensive review of interventions in the NOD mouse and implications for translation. Immunity 23: 115-126. Goudy, K. S., R. Tisch. 2005. Immunotherapy for the prevention and treatment of type 1 diabetes. Int. Rev. Immunol. 24: 307-326. Atkinson, M. A., E. H. Leiter. 1999. The NOD mouse model of type 1 diabetes: as good as it gets?. Nat. Med. 5: 601-604. Silveira, P. A., S. T. Grey. 2006. B cells in the spotlight: innocent bystanders or major players in the pathogenesis of type 1 diabetes. Trends Endocrinol. Metabol. 17: 128-135. Signore, A., P. Pozzilli, E. A. Gale, D. Andreani, P. C. Beverley. 1989. The natural history of lymphocyte subsets infiltrating the pancreas of NOD mice. Diabetologia 32: 282-289. Kendall, P. L., G. Yu, E. J. Woodward, J. W. Thomas. 2007. Tertiary lymphoid structures in the pancreas promote selection of B lymphocytes in autoimmune diabetes. J. Immunol. 178: 5643-5651. Lehuen, A., A. Bendelac, J. F. Bach, C. Carnaud. 1990. The nonobese diabetic mouse model: independent expression of humoral and cell-mediated autoimmune features. J. Immunol. 144: 2147-2151. Noorchashm, H., N. Noorchashm, J. Kern, S. Y. Rostami, C. F. Barker, A. Naji. 1997. B-cells are required for the initiation of insulitis and sialitis in nonobese diabetic mice. Diabetes 46: 941-946. Serreze, D. V., H. D. Chapman, D. S. Varnum, M. S. Hanson, P. C. Reifsnyder, S. D. Richard, S. A. Fleming, E. H. Leiter, L. D. Shultz. 1996. B lymphocytes are essential for the initiation of T cell-mediated autoimmune diabetes: analysis of a new “speed congenic” stock of NOD.Igμnull mice. J. Exp. Med. 184: 2049-2053. Akashi, T., S. Nagafuchi, K. Anzai, S. Kondo, D. Kitamura, S. Wakana, J. Ono, M. Kikuchi, Y. Niho, T. Watanabe. 1997. Direct evidence for the contribution of B cells to the progression of insulitis and the development of diabetes in non-obese diabetic mice. Int. Immunol. 9: 1159-1164. Yang, M., B. Charlton, A. M. Gautam. 1997. Development of insulitis and diabetes in B cell-deficient NOD mice. J. Autoimmun. 10: 257-260. Chiu, P. P., D. V. Serreze, J. S. Danska. 2001. Development and function of diabetogenic T-cells in B-cell-deficient nonobese diabetic mice. Diabetes 50: 763-770. AbuAttieh, M., M. Rebrovich, P. J. Wettstein, Z. Vuk-Pavlovic, A. H. Limper, J. L. Platt, M. Cascalho. 2007. Fitness of cell-mediated immunity independent of repertoire diversity. J. Immunol. 178: 2950-2960. Serreze, D. V., S. A. Fleming, H. D. Chapman, S. D. Richard, E. H. Leiter, R. M. Tisch. 1998. B lymphocytes are critical antigen-presenting cells for the initiation of T cell-mediated autoimmune diabetes in nonobese diabetic mice. J. Immunol. 161: 3912-3918. Falcone, M., J. Lee, G. Patstone, B. Yeung, N. Sarvetnick. 1998. B lymphocytes are crucial antigen-presenting cells in the pathogenic autoimmune response to GAD65 antigen in nonobese diabetic mice. J. Immunol. 161: 1163-1168. Noorchashm, H., Y. K. Lieu, N. Noorchashm, S. Y. Rostami, S. A. Greeley, A. Schlachterman, H. K. Song, L. E. Noto, A. M. Jevnikar, C. F. Barker, A. Naji. 1999. I-Ag7-mediated antigen presentation by B lymphocytes is critical in overcoming a checkpoint in T cell tolerance to islet β cells of nonobese diabetic mice. J. Immunol. 163: 743-750. Bouaziz, J. D., K. Yanaba, G. M. Venturi, Y. Wang, R. M. Tisch, J. C. Poe, T. F. Tedder. 2007. Therapeutic B cell depletion impairs adaptive and autoreactive CD4+ T cell activation in mice. Proc. Natl. Acad. Sci. USA 104: 20878-20883. Silverman, G. J., S. Weisman. 2002. Rituximab therapy and autoimmune disorders: prospects for anti-B cell therapy. Arthritis Rheum. 48: 1484-1492. Uchida, J., Y. Lee, M. Hasegawa, Y. Liang, A. Bradney, J. A. Oliver, K. Bowen, D. A. Steeber, K. M. Haas, J. C. Poe, T. F. Tedder. 2004. Mouse CD20 expression and function. Int. Immunol. 16: 119-129. Uchida, J., Y. Hamaguchi, J. A. Oliver, J. V. Ravetch, J. C. Poe, K. M. Haas, T. F. Tedder. 2004. The innate mononuclear phagocyte network depletes B lymphocytes through Fc receptor-dependent mechanisms during anti-CD20 antibody immunotherapy. J. Exp. Med. 199: 1659-1669. Hamaguchi, Y., J. Uchida, D. W. Cain, G. M. Venturi, J. C. Poe, K. M. Haas, T. F. Tedder. 2005. The peritoneal cavity provides a protective niche for B1 and conventional B lymphocytes during anti-CD20 immunotherapy in mice. J. Immunol. 7: 4389-4399. Hasegawa, H., Y. Hamaguchi, K. Yanaba, J.-D. Bouaziz, J. Uchida, M. Fujimoto, T. Matsushita, Y. Matsushita, M. Horikawa, K. Komura, et al 2006. B-lymphocyte depletion reduces skin fibrosis and autoimmunity in the tight-skin mouse model for systemic sclerosis. Am. J. Pathol. 169: 954-966. Hayakawa, I., T. F. Tedder, Y. Zhuang. 2007. B-lymphocyte depletion ameliorates Sjogren’s syndrome in Id3 knockout mice. Immunology 122: 73-79. Nimmerjahn, F., J. V. Ravetch. 2006. Fcγ receptors: old friends and new family members. Immunity 24: 19-28. Takai, T.. 2002. Roles of Fc receptors in autoimmunity. Nat. Rev. Immunol. 2: 580-592. Tedder, T. F., A. Baras, Y. Xiu. 2006. Fcγ receptor-dependent effector mechanisms regulate CD19 and CD20 antibody immunotherapies for B lymphocyte malignancies and autoimmunity. Semin. Pathol. 28: 351-364. Nimmerjahn, F., P. Bruhns, K. Horiuchi, J. V. Ravetch. 2005. FcγRIV: a novel FcR with distinct IgG subclass specificity. Immunity 23: 41-51. Steeber, D. A., P. Engel, A. S. Miller, M. P. Sheetz, T. F. Tedder. 1997. Ligation of L-selectin through conserved regions within the lectin domain activates signal transduction pathways and integrin function in human, mouse and rat leukocytes. J. Immunol. 159: 952-963. Zhou, L.-J., H. M. Smith, T. J. Waldschmidt, R. Schwarting, J. Daley, T. F. Tedder. 1994. Tissue-specific expression of the human CD19 gene in transgenic mice inhibits antigen-independent B lymphocyte development. Mol. Cell. Biol. 14: 3884-3894. Gotoh, M., T. Maki, T. Kiyoizumi, S. Satomi, A. P. Monaco. 1985. An improved method for isolation of mouse pancreatic islets. Transplantation 40: 437-438. Engel, P., Y. Nojima, D. Rothstein, L.-J. Zhou, G. L. Wilson, J. H. Kehrl, T. F. Tedder. 1993. The same epitope on CD22 of B lymphocytes mediates the adhesion of erythrocytes, T and B lymphocytes, neutrophils and monocytes. J. Immunol. 150: 4719-4732. Gavin, A. L., E. H. Leiter, P. M. Hogarth. 2000. Mouse FcγRI: identification and functional characterization of five new alleles. Immunogenetics 51: 206-211. Mechetina, L. V., A. M. Najakshin, B. Y. Alabyev, N. A. Chikaev, A. V. Taranin. 2002. Identification of CD16-2, a novel mouse receptor homologous to CD16/FcγRIII. Immunogenetics 54: 463-468. Tisch, R., R. S. Liblau, X. D. Yang, P. Liblau, H. O. McDevitt. 1998. Induction of GAD65-specific regulatory T-cells inhibits ongoing autoimmune diabetes in nonobese diabetic mice. Diabetes 47: 894-899. Martin, R. M., J. L. Brady, A. M. Lew. 1998. The need for IgG2c specific antiserum when isotyping antibodies from C57BL/6 and NOD mice. J. Immunol. Methods 212: 187-192. Pritchard, N. R., A. J. Cutler, S. Uribe, S. J. Chadban, B. J. Morley, K. G. Smith. 2000. Autoimmune-prone mice share a promoter haplotype associated with reduced expression and function of the Fc receptor FcγRII. Curr. Biol. 10: 227-230. Prins, J. B., J. A. Todd, N. R. Rodrigues, S. Ghosh, P. M. Hogarth, L. S. Wicker, E. Gaffney, P. L. Podolin, P. A. Fischer, A. Sirotina, L. B. Peterson. 1993. Linkage on chromosome 3 of autoimmune diabetes and defective Fc receptor for IgG in NOD mice. Science 260: 695-698. Gavin, A. L., J. A. Hamilton, P. M. Hogarth. 1996. Extracellular mutations of non-obese diabetic mouse FcγRI modify surface expression and ligand binding. J. Biol. Chem. 271: 17091-17099. Di Virgilio, F., B. C. Meyer, S. Greenberg, S. C. Silverstein. 1988. Fc receptor-mediated phagocytosis occurs in macrophages at exceedingly low cytosolic Ca2+ levels. J. Cell Biol. 106: 657-666. Tedder, T. F., D. A. Steeber, P. Pizcueta. 1995. L-selectin deficient mice have impaired leukocyte recruitment into inflammatory sites. J. Exp. Med. 181: 2259-2264. Greeley, S. A. W., D. J. Moore, H. Noorchashm, L. E. Noto, S. Y. Rostami, A. Schlachterman, H. K. Song, B. Koeberlein, C. F. Barker, A. Naji. 2001. Impaired activation of islet-reactive CD4 T cells in pancreatic lymph nodes of B cell-deficient nonobese diabetic mice. J. Immunol. 167: 4351-4357. Vallerskog, T., I. Gunnarsson, M. Widhe, A. Risselada, L. Klareskog, R. van Vollenhoven, V. Malmstrom, C. Trollmo. 2007. Treatment with rituximab affects both the cellular and the humoral arm of the immune system in patients with SLE. Clin. Immunol. 122: 62-74. Vigna-Perez, M., B. Hernandez-Castro, O. Paredes-Saharopulos, D. Portales-Perez, L. Baranda, C. Abud-Mendoza, R. Gonzalez-Amaro. 2006. Clinical and immunological effects of Rituximab in patients with lupus nephritis refractory to conventional therapy: a pilot study. Arthritis Res. Ther. 8: R83-R91. Amrani, A., J. Verdaguer, P. Serra, S. Tafuro, R. Tan, P. Santamaria. 2000. Progression of autoimmune diabetes driven by avidity maturation of a T-cell population. Nature 406: 739-742. Hulbert, C., B. Riseili, M. Rojas, J. W. Thomas. 2001. B cell specificity contributes to the outcome of diabetes in nonobese diabetic mice. J. Immunol. 167: 5535-5538. Silveira, P. A., E. Johnson, H. D. Chapman, T. Bui, R. M. Tisch, D. V. Serreze. 2002. The preferential ability of B lymphocytes to act as diabetogenic APC in NOD mice depends on expression of self-antigen-specific immunoglobulin receptors. Eur. J. Immunol. 32: 3657-3666. DiLillo, D. J., Y. Hamaguchi, Y. Ueda, K. Yang, J. Uchida, K. M. Haas, G. Kelsoe, T. F. Tedder. 2008. Maintenance of long-lived plasma cells and serological memory despite mature and memory B cell depletion during CD20 immunotherapy in mice. J. Immunol. 180: 361-371. Fossati-Jimack, L., A. Ioan-Facsinay, L. Reininger, Y. Chicheportiche, N. Watanabe, T. Saito, F. M. A. Hofhuis, J. E. Gessner, C. Schiller, R. E. Schmidt, et al 2000. Markedly different pathogenicity of four immunoglobulin G isotype-switch variants of an antierythrocyte autoantibody is based on their capacity to interact in vivo with the low-affinity Fcγ receptor III. J. Exp. Med. 191: 1293-1302. Azeredo da Silveira, S., S. Kikuchi, L. Fossati-Jimack, T. Moll, T. Saito, J. S. Verbeek, M. Botto, M. J. Walport, M. Carroll, S. Izui. 2002. Complement activation selectively potentiates the pathogenicity of the IgG2b and IgG3 isotypes of a high affinity anti-erythrocyte autoantibody. J. Exp. Med. 195: 665-672. Ioan-Facsinay, A., S. J. de Kimpe, S. M. M. Hellwig, P. L. van Lent, F. M. A. Hofhuis, H. H. van Ojik, C. Sedlik, S. A. da Silveira, J. Gerber, Y. F. de Jong, et al 2002. FcγRI (CD64) contributes substantially to severity of arthritis, hypersensitivity responses, and protection from bacterial infection. Immunity 16: 391-402. Nimmerjahn, F., J. V. Ravetch. 2005. Divergent immunoglobulin G subclass activity through selective Fc receptor binding. Science 310: 1510-1512. Cartron, G., L. Dacheux, G. Salles, P. Solal-Celigny, P. Bardos, P. Colombat, H. Watier. 2002. Therapeutic activity of humanized anti-CD20 monoclonal antibody and polymorphism in IgG Fc receptor FcγRIIIa gene. Blood 99: 754-758. Anolik, J. H., D. Campbell, R. E. Felgar, F. Young, I. Sanz, J. Rosenblatt, R. J. Looney. 2003. The relationship of FcγRIIIa genotype to degree of B cell depletion by rituximab in the treatment of systemic lupus erythematosus. Arthritis Rheum. 48: 455-459. Weng, W.-K., R. Levy. 2003. Two immunoglobulin G fragment C receptor polymorphisms independently predict response to rituximab in patients with follicular lymphoma. J. Clin. Oncol. 21: 3940-3947. Kataoka, S., J. Satoh, H. Fujiya, T. Toyota, R. Suzuki, K. Itoh, K. Kumagai. 1983. Immunologic aspects of the nonobese diabetic (NOD) mouse: abnormalities of cellular immunity. Diabetes 32: 247-253. O’Brien, B. A., Y. Huang, X. Geng, J. P. Dutz, D. T. Finegood. 2002. Phagocytosis of apoptotic cells by macrophages from NOD mice is reduced. Diabetes 51: 2481-2488. Bouma, G., T. Nikolic, J. M. Coppens, C. G. van Helden-Meeuwsen, P. J. Leenen, H. A. Drexhage, S. Sozzani, M. A. Versnel. 2005. NOD mice have a severely impaired ability to recruit leukocytes into sites of inflammation. Eur. J. Immunol. 35: 225-235.